Man, it's weird looking back at old art even when it's only from a couple of years ago like that. Although while I'm offering up links to old pages, why not get some Blues in on it? Everyone remember Protocol? We've seen her a couple of times besides this page but this one's the most direct case before now so yeah. More details are to come on that front obviously but she's going to be a major player in the next story arc. And no, she's not just slotting right into the Marvelous Man role, we've got other things in mind. Whew.... Okay, work's been extra late so this one was drawn as exhaustingly as possible. I point this out because I'm really impressed with how good the lineart and especially the colors came out under the conditions it was drawn in. Lot to unpack for this one. Protocol, after some seeds planted, will be a major figure in the next arc. A major problem I have with this page is that she looks WAY too sinister, like she's going to be the next villain. She's absolutely not, I really regret her being framed so evily. Also Aiden Frost, it turns out, is Hazel from Wright As Rayne. After being humiliated by Marvelous Man in a WaR chapter, he hired a PI to shadow him for blackmail material. It is kinda weird that it's being revealed in such a backdoor way, but I guess in the grand scheme it's not THAT important for Blues. Hazel was just a catalyst; I think if it wasn't for him, something else would've set Marvelous Man off eventually and required the kids to step in. It's actually more important for WaR than Blues; it establishes that Hazel is MUCH more vindictive than people give him credit for, and isn't the kind to back down if he's outmatched. Various minor gags were fun. ^^ Su is wearing a shirt reading "Camp Crystal Lake Track Team," which I kinda want myself but wouldn't make any sense to be worn by a boy. Extras include Scar and Rose from Fullmetal Alchemist, David from Prometheus and.... I think maybe Chell from Portal? Appropriate, since GLaDOS was honestly a BIG influence on Protocol. Oh man this is so good, I can not wait to see what happens next. All so can we see the kids parents reaction to all this? And I think Protocolmaybe the hero the kids need, and lastly great Stan lee cameo. Absolutely agree with everything said here. Can we PLEASE see the kids’ parents reactions! Pretty please! And thought that was meant to be Stan given the starstruck nature of “Wait, aren’t you”, but couldn’t be certain. Heheh... Don't worry, we kinda can't NOT show the reactions of the parents. That's actually gonna be one of the major focuses. Again can't wait to see the parents reactions. All so I don't think there is away to make Protocol look like the good guy in this, I think it has to do with her robot eye, I think that is making her look mostly like the bad guy. Anything else I might to say was already said by babygirl, as said in my reply to her post. Only other thing to note...YOU CAN’T SEPERATE LENORE AND XANDY! Those two are the best cutest little filler hostesses and make for an adorable back and forth! Doing so would be pure evil! Heheh.... I guess maybe I should warn folks beforehand this time; the next set of Filler WILL have a pair of guest hosts, but that's only temporary while Lenore and Xandy get things sorted out. They'll be hosting all the other filler afterward. Came up with a cute gimmick involving the Atlanta thing. if I can say something on who should be the next filler hosts, can it be professor Blake and Dr mariposa or maybe Miss Tickle and Miss Su. Man oh man can Hazel hold a grudge, I knew he had a lot more going for him than anybody thought but geez, looking forward to learning what role Protocol will play in the next story arc and who the next villain will be. Heheh... Do hope you'll enjoy when it comes. ^^ Gladja appreciated that little bit of danger with Hazel. This is a bit nitpicky. But I don't approve of the extras of Scar and Rose being light-skinned. They were both of darker skin tones. Kind of a mix of the lighting and me just being in a rush coloring it so I wasn't really paying terribly much mind to how extras were coming out. I did make them darker than those around them, but not as much as I could've and the lighting made it not really show much. Here's how they look without that. 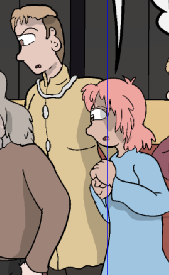 Though part of it is also in how when I color extras Adam bases on people I tend to try to make them look different from the source material. Plus with the Rose one I was also trying to work in some Kumatora.